Our regular readers were probably wondering, “When is that Rob kid going to post again?” Well folks, I’m back. And yes, Luke asked me how my journal post was coming along as an extra driving aid to get this journal done. To be honest, I had a pretty difficult time brainstorming ideas for this journal; and yes, I followed my high school English teachers’ suggestions of writing the intro last. I’ve been spending a fair amount of time in the tractor recently, and most of this was thought out in the cab while cutting or raking hay. So I hope this is enjoyable for you guys to read. 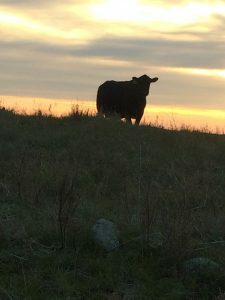 I’ve spent almost two and a half months here at Rock Hills Ranch now, and it would take me several journal posts to write and start explaining everything that I’ve learned and observed here. I’ve learned about range monitoring, different ways to plan out grazing systems, and a more. I wrote a whole journal post on observations, and there’s more than what I wrote about then. Some of the things have been brand new to me and some are good refreshers to my mind. I was cutting hay down in what we call the flats-I told Luke and Lyle it’s more like you’re in a boat on the water with how the tractor rides-and I thought to myself “ What would the old time cowboys think about all the stuff we do here? I mean, what would they think of cross fencing, rotational grazing, how we run around to the different herds on 4 wheelers instead of horses, range monitoring and everything else we do?” and that made me sit and think. Why do we do all this stuff? So here’s Rob’s explanation of why we do what we do. Cross fencing. If you ask just about any person my age what their least favorite part about cows is, 95% would say fencing. Fencing can be no fun at times. It’s hot, you’re swinging a post pounder driving in posts trying not to hit a subsurface rock, and you only have half mile more of posts every 20 feet apart. Old wire is brittle and doesn’t bend the right way, the new wire is a spring ready to go everywhere if you don’t take it off the spool the right way. I look at it as “if you’re gonna have cows, you’re gonna have fencing to do.” Here at RHR, I’ve been told that we have somewhere around 60 miles of fence and almost half is interior cross fencing. Why? Part of it is previous owners who divided it into smaller pastures and a big reason is so that we can keep the cattle in a certain area so that we can have a better utilization of the grass. On the other side of that thought is that we can keep cattle out of certain areas for different reasons. Rotational Grazing. Luke and I move groups of cattle every week. Out of one area and into the next. Why? Grass. We move the cattle through the different pastures at different times for the grass. We know that certain species are more palatable at certain times of the growing phase. We run the cows in a big enough group that they shouldn’t be able to pick and choose what grasses to eat, instead they have to get a mouth full of everything out there. This is better for the grass because then one species isn’t taking all the abuse. In one of my range classes with Dr. Sandy Smart at SDSU, he compared and contrasted rotational grazing to season long(turn cows out in spring and don’t move them until fall) using two circles drawn on the white board. Both circles were divided into half, and on one side of both circles, Sandy wrote leave. He then explained how many land managers use a “take half, leave half” approach. Leaving half of the grass that is available allows the grass to have a chance to regrow healthily, provide habitat to ground nesting birds and small animals and a few other reasons. He then went to the season long grazed circle and drew a line dividing the half into two quarters. In the top quarter he wrote “trampled” meaning that of the half of grass you take, half of it will be stepped on, lay on, anything but ate. The last quarter he wrote “throat” meaning that only 25% of what grass was available, was actually eaten. The rotational grazing circle the 50% that was taken was divided into two unequal parts. For an example, we’ll say that instead of 25% being ate, you can increase it to 35-40%! This is because the cows aren’t allowed to be picky about which grass to eat; another 10-15% could be a lot of grass depending on the ground! Rotational grazing also helps cows with more consistent weight gains, keeps nutrition more equal which plays into reproductive performance. The number one reason of why cows leave the farm is reproductive status according to university studies. There are more benefits to rotational grazing, but I’m just going to highlight a few. 4 wheelers and range monitoring. Anyone who knows me knows that I would pick a horse over a 4 wheeler just like the old time cowboys. The truth is, sometimes I have to get 5 miles down the road right now to get to the hay field. I also know that when we take mineral and salt to the cows, I’ve had several hundred pounds of it strapped to the ATV, or when we move cows, we pull a salt and mineral feeder sled behind the ATV and they can weigh a lot. And blah blah blah.. Enough on 4 wheelers, and more on Range monitoring. Each time we move cows, we do range monitoring. We use our handy dandy grazing yardstick, and head out. We try to find a place that is a good uniform representation of the whole pasture and take a picture. 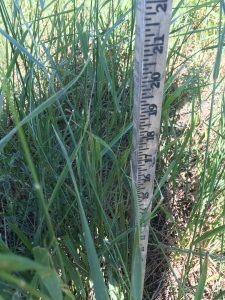 We then use the grazing stick to measure the height of the key species in the pasture-this is where Rob struggles because is this Kentucky Bluegrass? Is it Green Needle Grass? Side Oats Gramma? I’m getting better though!- We take these pictures and use them for record keeping. These records are used in grazing recording and planning, it is used in conservation programs that we do, and it helps them know what condition they have left the range in. We care a lot about the land and we want to make sure we aren’t abusing the resource we have. Why do we do what we do? We do it to take care of the land. When we take care of the land, it takes care of us. Lyle and Garnet have taken care of the land so that Luke and Naomi can be here. I know that they are doing their best to take care of the land so that the kids can have a chance at taking care of the land. That’s what everyone involved in family ag operations do. They take care of the land for the next generation. It’s not for us, it’s for them. Keep your cinch pulled tight.